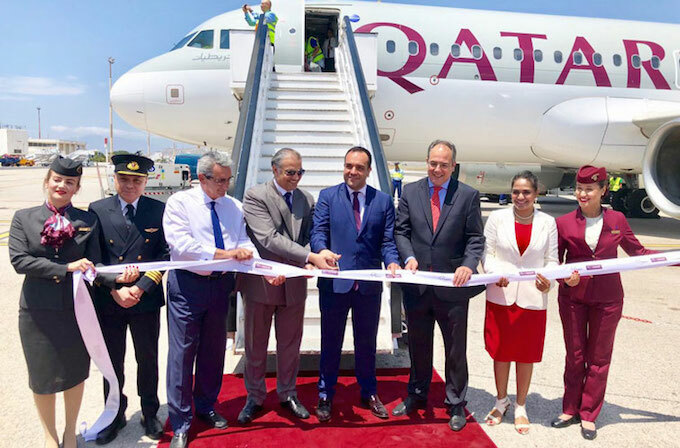 Qatar Airways has celebrated the start of its new direct non-stop service from Doha to Mykonos at Mykonos International Airport. The newly-launched seasonal service to one of Greece’s most popular islands will operate a four-times-weekly service from Doha. Mykonos is a world–renowned cosmopolitan island and a paradise in the heart of the Cyclades. The small island is known for its picturesque views and beautiful sandy beaches. There are many things to do in Mykonos such as walking along the narrow streets of Chora, watching the sunset from Little Venice, staying in luxurious hotels and swimming in the clear sea of the Aegean. His Excellency Akbar Al Baker, Qatar Airways Group chief executive, said: “We are thrilled that we have further expanded our operations to the beautiful island of Mykonos, only two months after the launch of service to Thessaloniki. [The] inaugural flight to popular Mykonos marks further growth and strengthening bonds between the State of Qatar and Greece. Alexander Zinell, chief executive officer of Fraport Greece, said: “It is with great pleasure that all of us at Fraport Greece welcome Qatar Airways’ new route from Doha to Mykonos. Mykonians, who have turned their island into a unique global touristic attraction, will now welcome passengers arriving four times a week directly from Doha. Four weekly seasonal flights to Mykonos International Airport will be operated by an Airbus A320, featuring 12 seats in Business Class and 132 seats in Economy Class. With the launch of Mykonos, Qatar Airways increased its flights to 58 times a week from Doha’s five-star Hamad International Airport to Greece.